A BUBBLING CAULDRON: 'Twas A Long Night, Indeed! 'Twas A Long Night, Indeed! The Costa Mesa City Council met yesterday - and part of today - in the longest meeting so far for this new group. If you count the time they were in Closed Session beginning at 4:00 p.m. Tuesday, they were fully immersed in City business on our behalf for five minutes short of nine (9) hours! 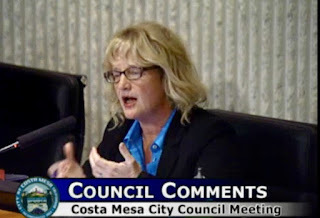 Yep, Mayor Katrina Foley closed the meeting at 12:55 a.m. today and I suspect all of us who were still in the auditorium at that time - I counted a dozen residents plus reporters and staffers - are still feeling it. I know I sure am. During Public Comments a Baker's Dozen of people stepped up to addressed the council on issues not on the agenda. Considering the size of the agenda last night, I'm surprised they actually found things that were not on it! 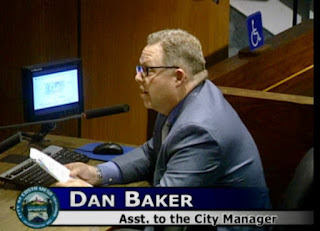 Barrie Fisher stepped up to thank City Manager Tom Hatch for helping her with her issues addressed at the last meeting regarding the deplorable condition of the commemorative bricks at Harbor Lawn Cemetery. We learned from Councilman Allan Mansoor that Hatch actually used some of his valuable free time over a weekend to go to the venue and scrub those bricks to try to resolve the issue. I agree with Mansoor - that's above and beyond. 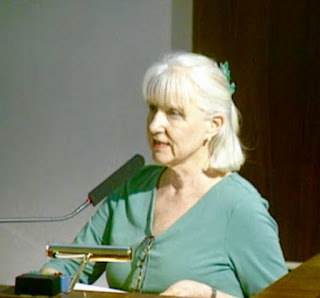 Flo Martin reminded us that today is a Green Coast Day at Orange Coast College. Those of you interested are already there. Dorothy McNiff again stepped up to complain about lack of responsiveness regarding the parking issues with the Beach Pit BBQ restaurant next door to her house. Mayor Katrina Foley assured her that a staff member would respond to her questions/concerns immediately. Nick Berardino and Kathy Kramer of the Orange County Fair and Event Center stepped up to express extreme appreciation for the City's participation with the Hero's Hall and said "There will always be a place for you at Hero's Hall." 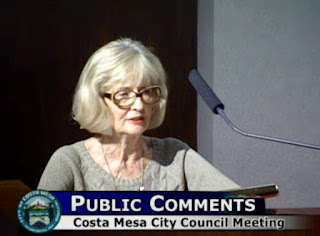 Tamar Goldmann again expressed concern about the impact development is having on parking in residential neighborhoods. Frank Carlson worried about coyotes and hoped some action can be taken. 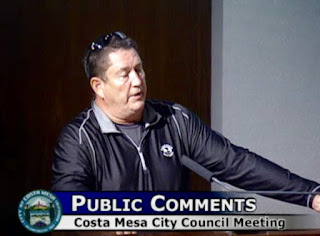 A VERY angry gent - I didn't catch his name - stepped up and criticized the City for lack of transparency. He complained about labor negotiations being done "behind closed doors" and groused about a "$120,000 dog catcher". 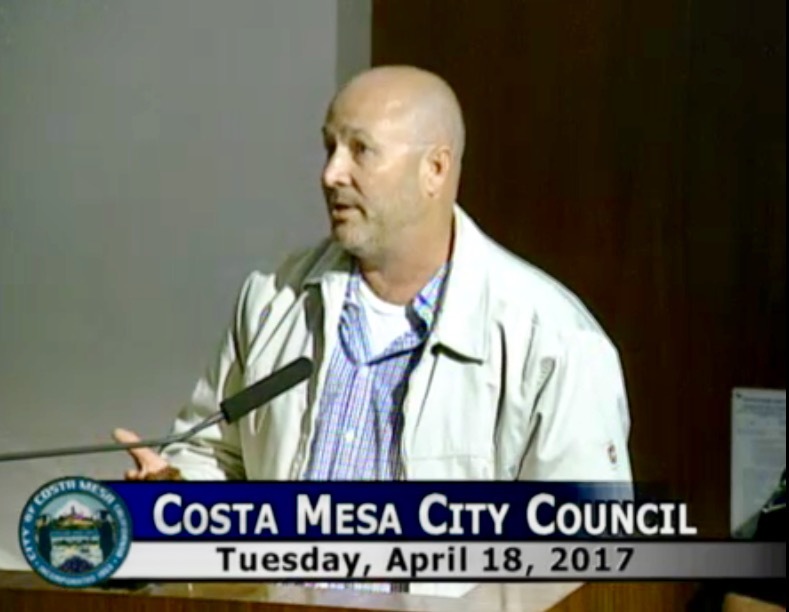 He complained about Sober Living Homes and accused the City of "taking money from Costa Mesa United." He was one angry dude. Wendy Leece thanked the City for changing the route of the upcoming Community Run. 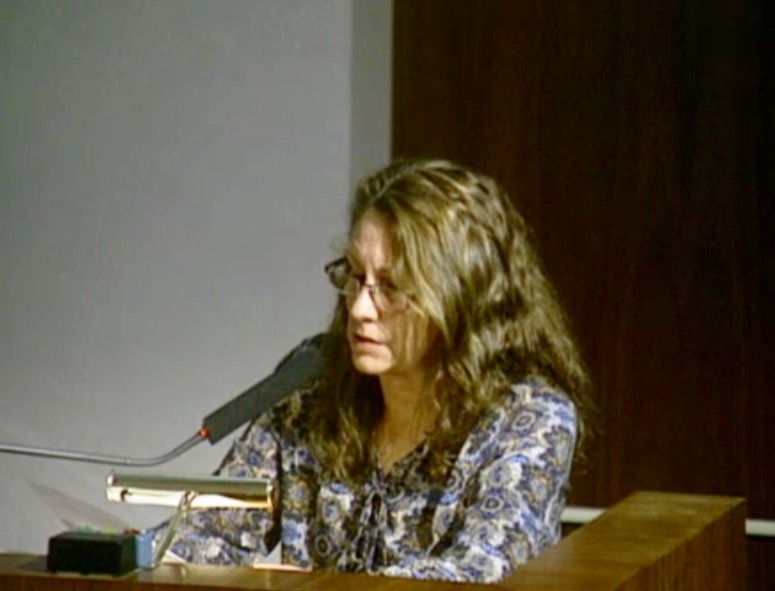 She asked for the City to budget for fencing around vernal pools in Fairview Park, citing a recent incident when a truck ran amok in the park. 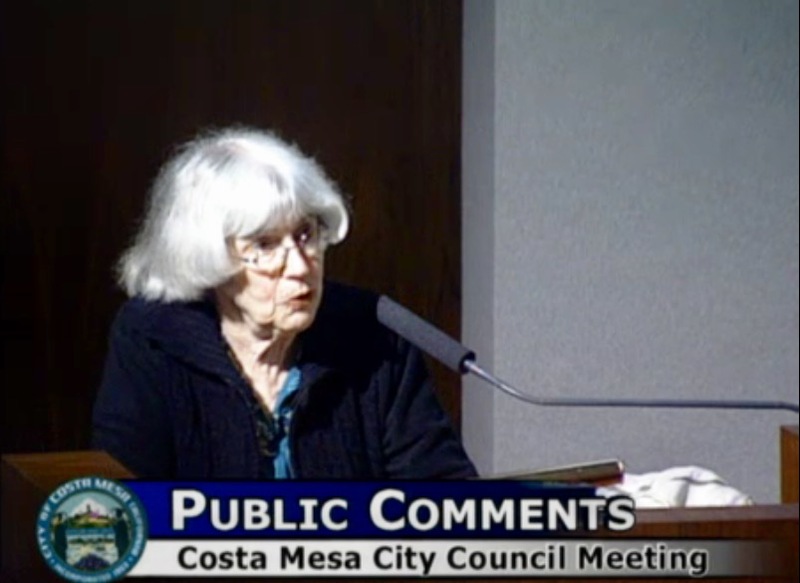 She also asked that time be budgeted to reassess the overlays planned for Newport and Harbor Boulevards. 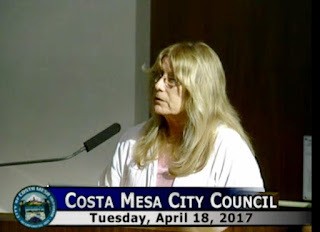 An unidentified woman complained about the size of the agenda, indicating that it's just wearing people out. She also observed that TBON - a group to which she belongs - was started because Assistant City Manager Rick Francis refused to identify sober living homes in the city. 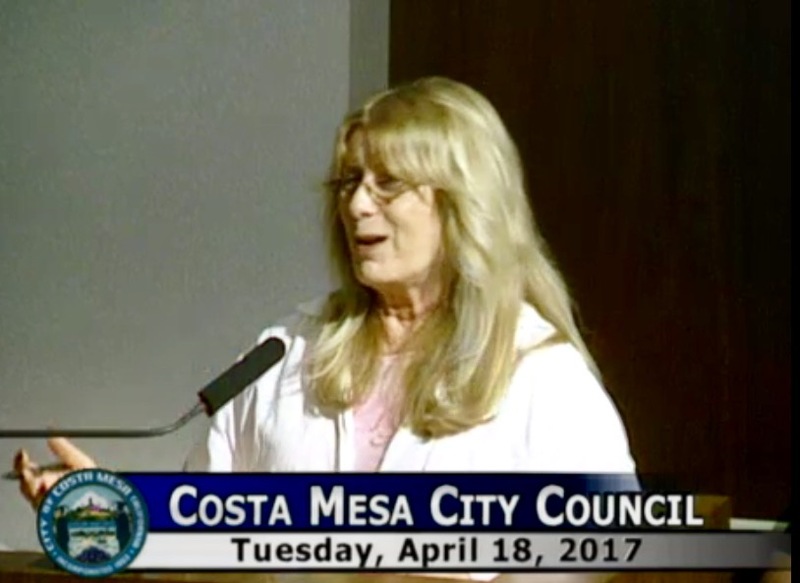 Cindy Black spoke about a cluster of sober living homes on the Westside, indicating frustration because she had brought this issue to the council three previous times. She was looking for a reply... soon. 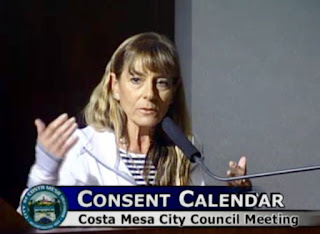 Cindy Brenneman again complained about the recent appointment process which resulted in a planning commissioner being placed in that role even though she had not followed the proper application process. 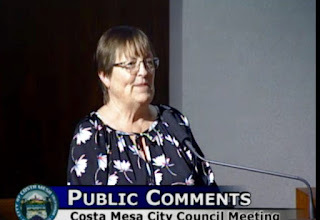 Robin Leffler agreed with many of the previous speakers, and corrected the record regarding the angry man's earlier comment about money being taken from Costa Mesa United. 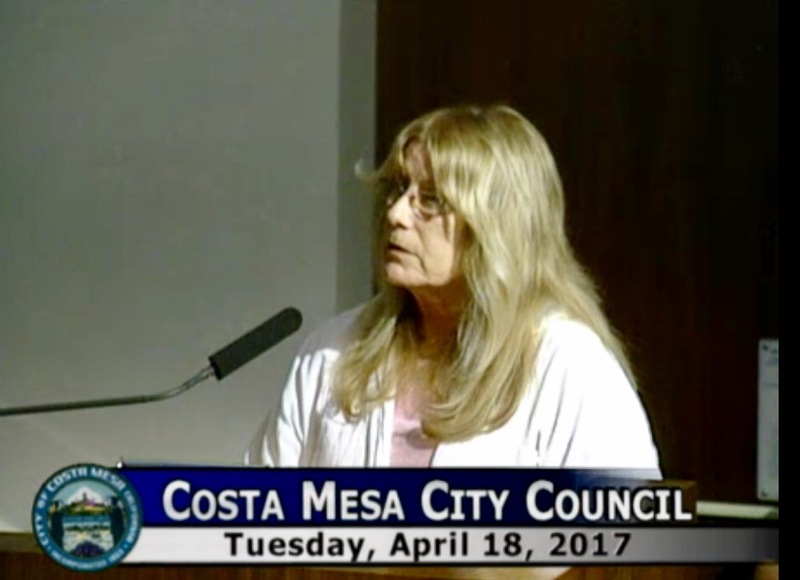 She agreed with Leece regarding the overlays on our two main streets and cited the development at 125 Baker Street as a reason for concern. Iggy Israel, a local businessman complained about not having access to staffers on the 5th floor of City Hall and called for City Manager Tom Hatch to resign. 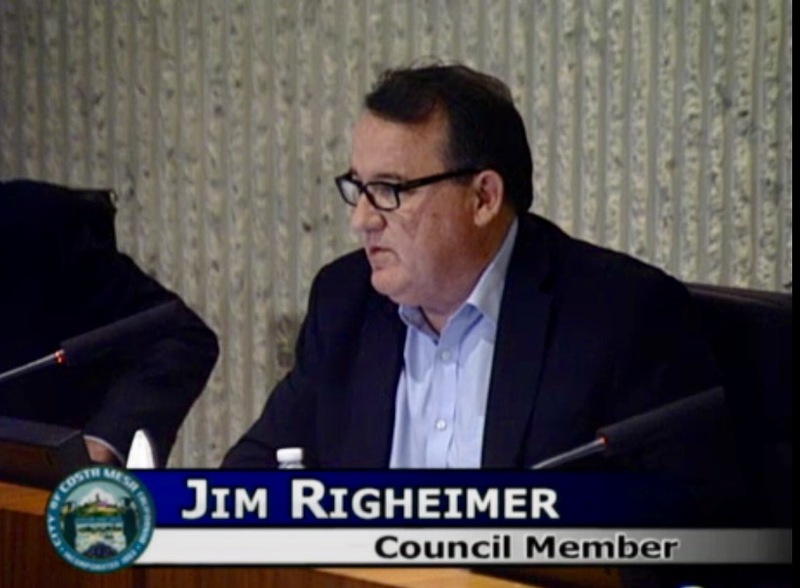 Councilman Jim Righeimer complained about "exparte communication". 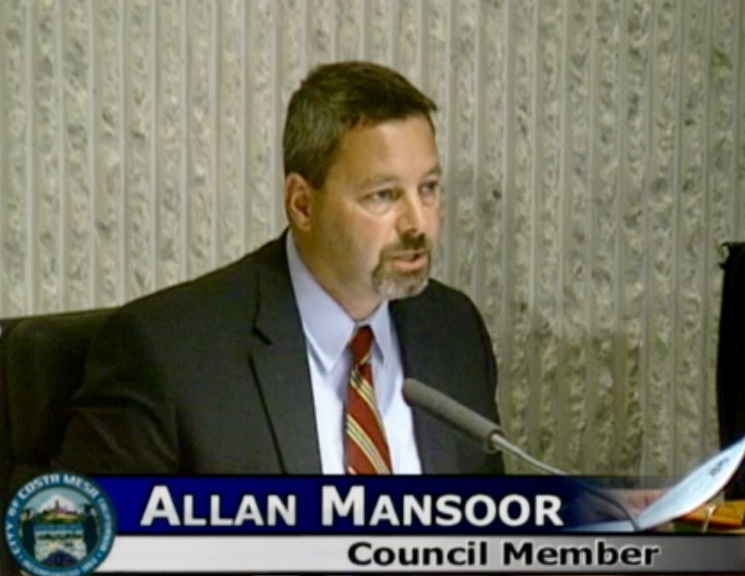 Counclman Allan Mansoor complained about a state tax increase, observing that he doesn't support it. He also told us about Hatch's cleanup job at Harbor Lawn. Mayor Katrina Foley, addressing the size of the agenda, said we are 4 years behind responding to individual needs, hence the aggressive agenda. She spoke about the trip she, Councilman Stephens, Hatch and another staffer made to San Antonio, Texas last week to observe and learn about the Haven of Hope facility, looking for insight on ways to address homelessness. They were there for a couple days and spent about 10 hours in meetings. 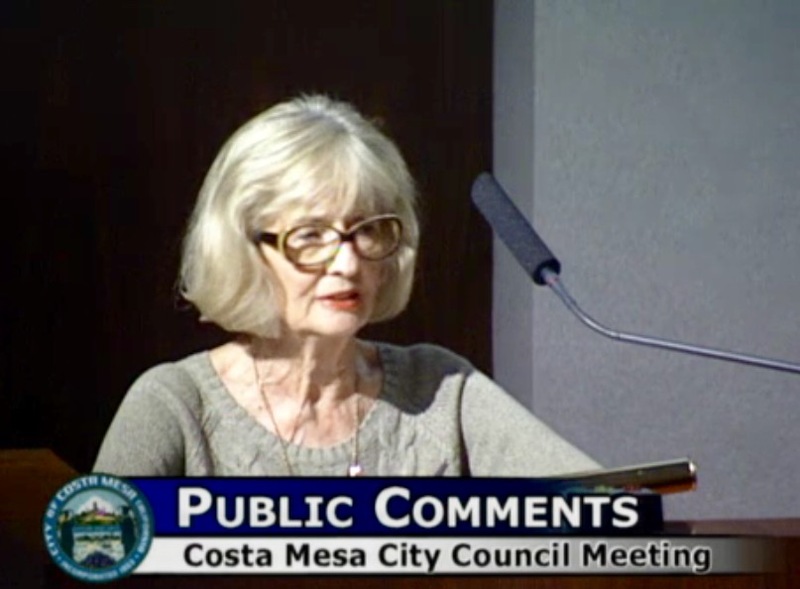 She said they all came away very enlightened, but gave us no specifics about how what she learned might be applied to Costa Mesa. 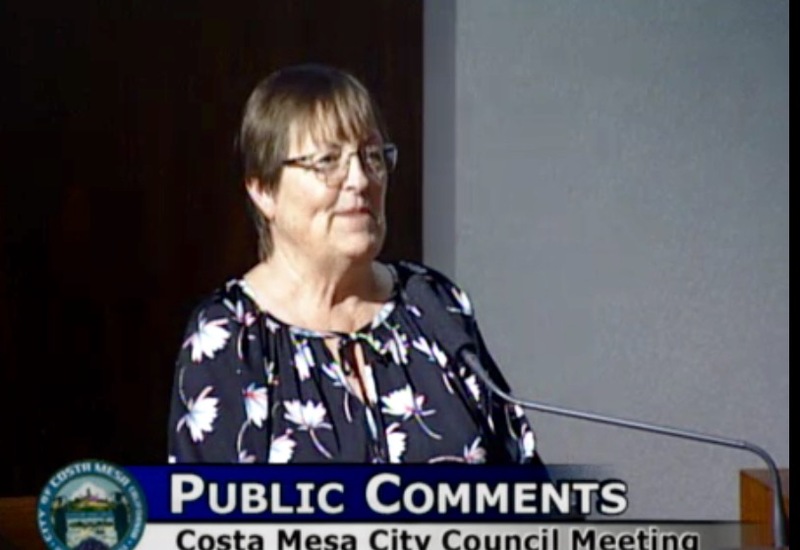 Mayor Pro Tem Sandra Genis spoke about recent Vector Control air drops, which she assured us was not dangerous to people or pets, just mosquitoes. She also addressed rules of conduct on the dais, reminding her peers up there about the existing rules and Roberts Rules of Order, which apply when others do not. Councilman John Stephens thanked the public for their comment and observed that Foley is really cracking the whip with their agendas. 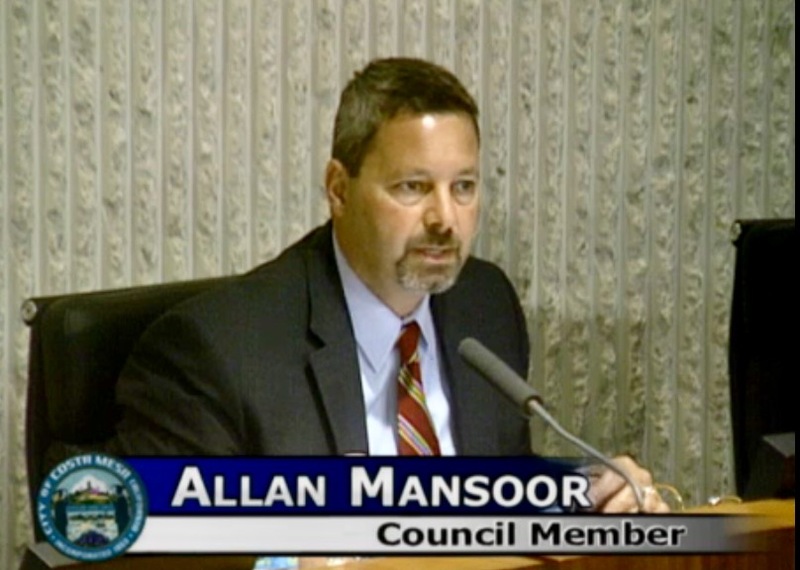 He also thanked Mansoor for his participation in their recent Homelessness forum, and the staff for their support. Four items were pulled from the Consent Calendar, Numbers 2, 5, 7 and 10. Item #2, the Warrant, received brief discussion and passed, 5-0. 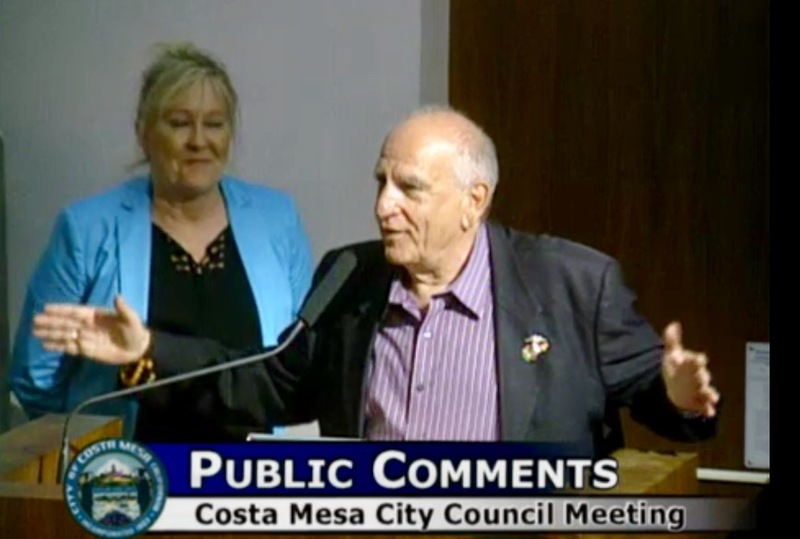 Item#5, the proposal to sell liquor at the Senior Center got some interesting discussion. Foley told us it was just a temporary measure due to the loss of the Neighborhood Community Center because of the Lions Park Project. She assured us that only the folks renting space at the Center would be dispensing alcohol. Beth Refakes advised that, after reading the staff report, it appeared that the staff had no clue about who the tenants were at the Senior Center, and spoke about the Freedom Committee. 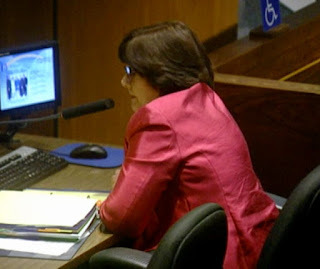 Cindy Brenneman also addressed this issue, too, and also addressed the Freedom Committee. 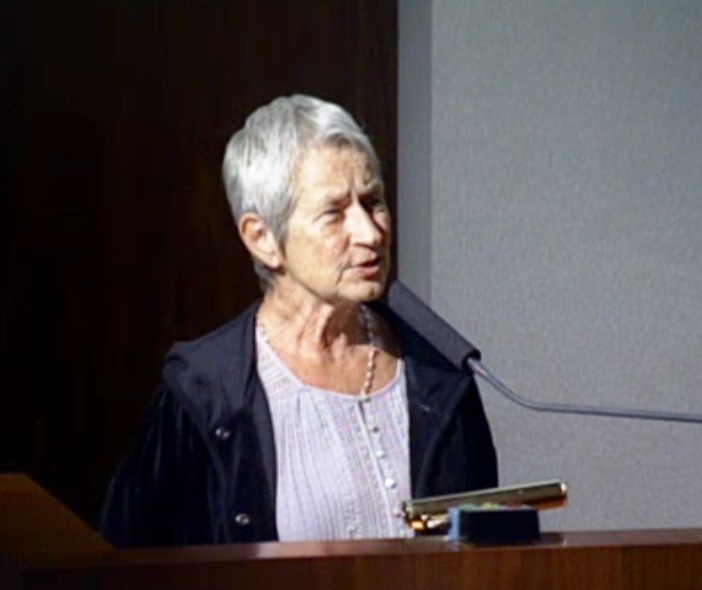 An unidentified woman also addressed this issue and referred to the way Newport Beach's Oasis Center is operated. 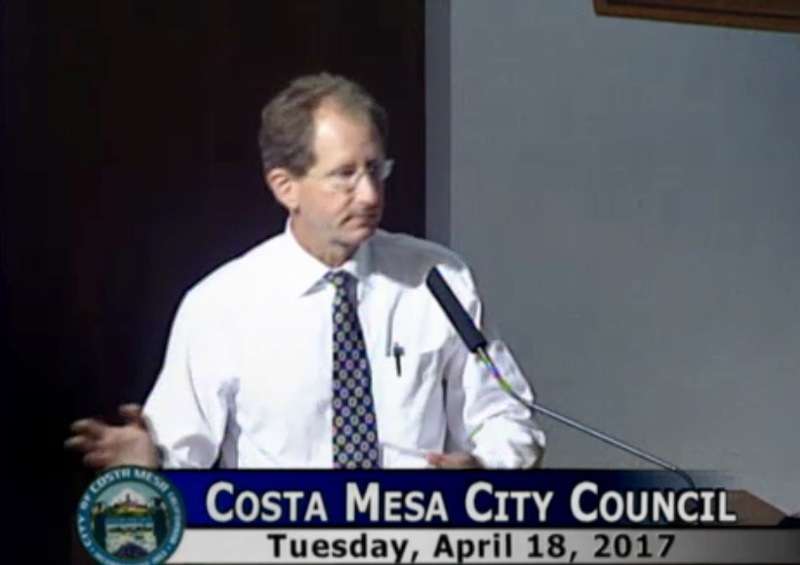 The issue passed on a 5-0 vote. Item #7, the Record Retention policy, was pulled for discussion by an unidentified woman. 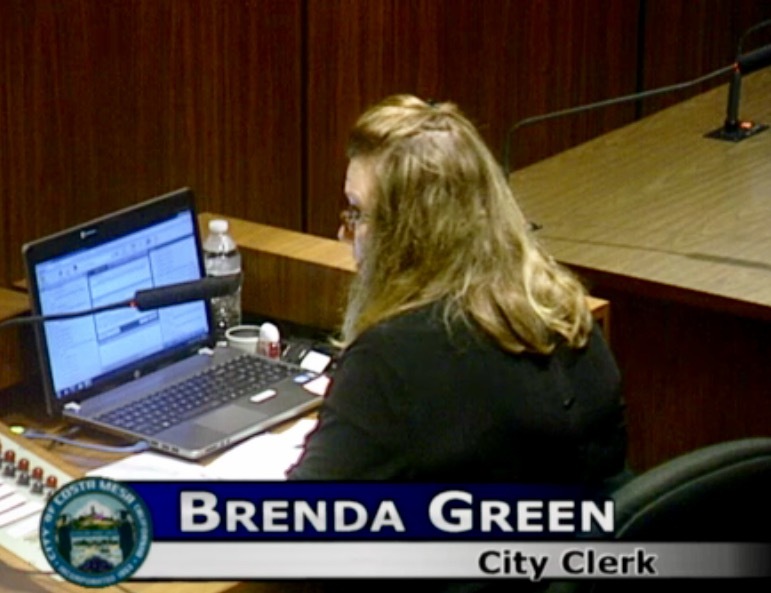 City Clerk Brenda Green explained the reasons for the system - it's state-mandated. The item passed, 5-0. Item #10 involved a cell tower. 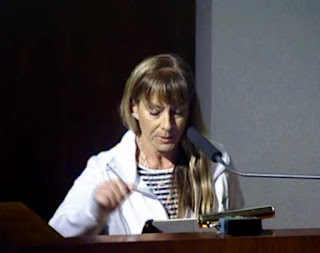 As the unidentified woman who pulled it for discussion stepped to the podium Righeimer recused himself because of his involvement in that business and walked toward the exit. The unidentified woman said, "That's why I'm here!" 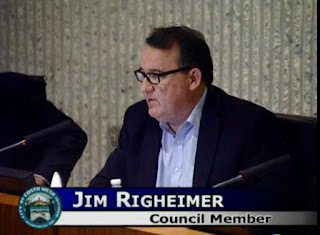 The remaining council members passed it, 4-0, and Righeimer did an immediate about-face and returned to his seat. At 7:25 Public Hearing #1, the COIN hearing on the pay and benefits changes for City management staff, began. Assistant City Manager Tammy Letourneau made a brief staff presentation, reminding the council of the terms of the changes - pay ranges increased for most levels which still left them about 5% below the regional average and other benefit changes regarding payment toward their PERS accounts. You can read the list of changes in the staff report on this issue HERE. There was NO public comment on this issue. Righeimer, not unexpectedly, said he won't support it because it's part of the bigger picture, pension-wise. Mansoor offered a similar comment. 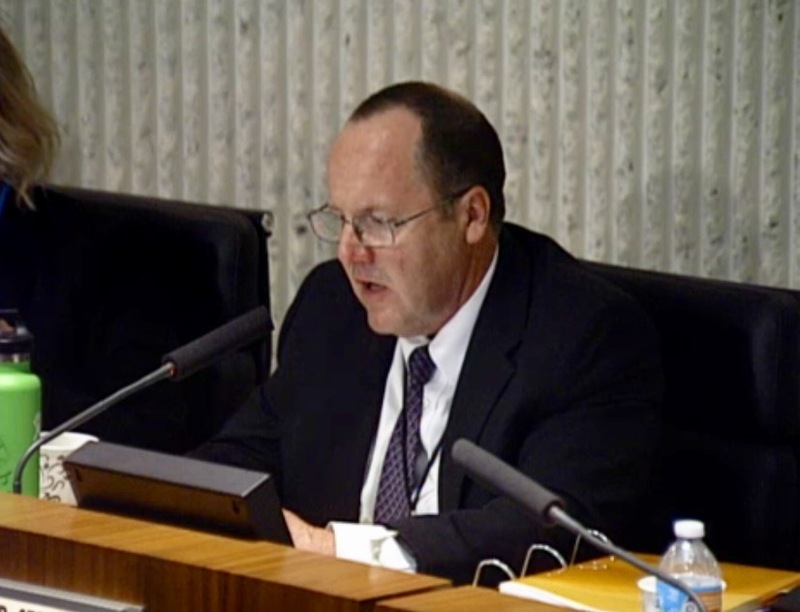 Foley observed that this change was long, long overdue and addressed the difficulty we're having attracting and retaining senior staffers because our compensation structure was so far behind the neighboring cities. 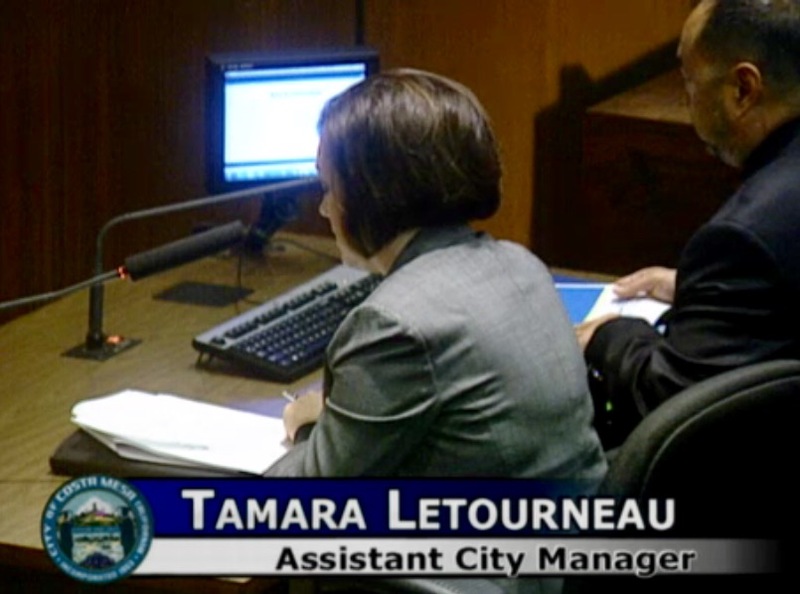 She addressed the 90 vacancies in the city - I actually think it's slightly fewer, but that's a close number. At 7:36 p.m. the issue passed on a 3-2 vote, with Righeimer and Mansoor voting NO. 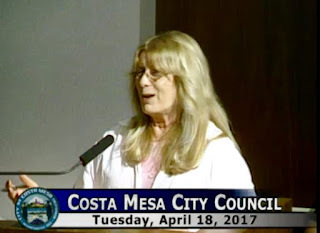 Then began Public Hearing #2, two Municipal Code amendments dealing with Sober Living Homes, particularly as it affects Reasonable Accommodation. 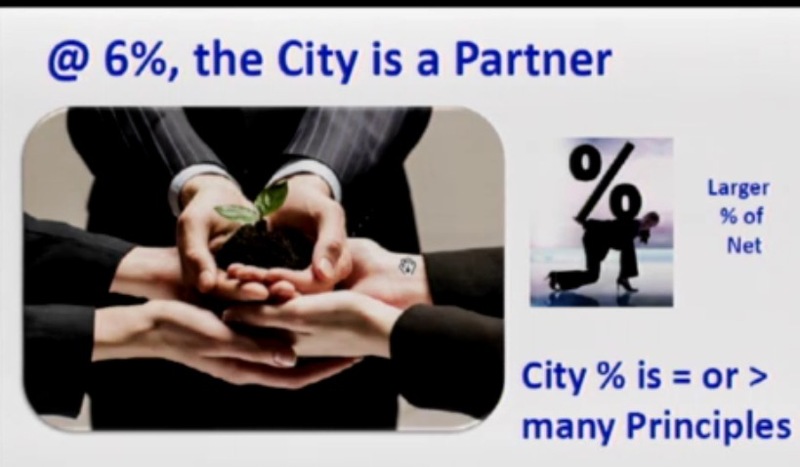 This was presented by consultant Sherry Vander Duessen, acting as Assistant Development Services Director. 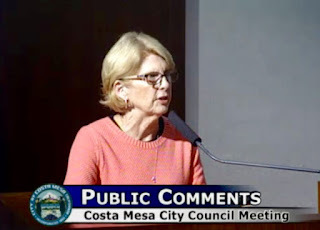 The Planning Commission had addressed these issues and recommended several changes to the council. The discussion, including comments by eleven (11) members of the public, dragged on for more than two and a quarter hours before the votes were taken. For an excellent summary of the issue see Luke Money's report in the Daily Pilot, HERE. A lot of time was spent reviewing a long spreadsheet that compared our practises to those of neighboring city, Newport Beach. In the end, all that conversation seemed not to make a difference. 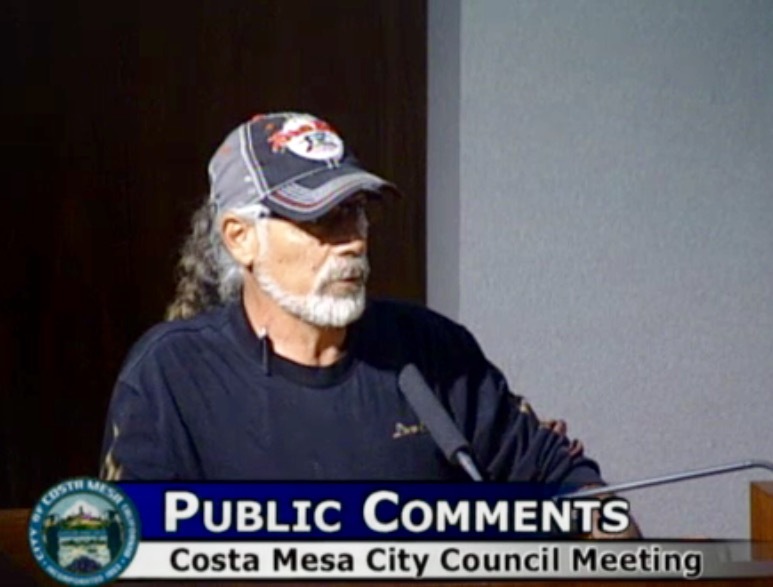 During the public comments segment a freshly-scrubbed homeless man, who identified himself as Bradley, a 64 year-old man with a painful history of alcohol abuse who told us he was over 500 days sober, described being victimized by unscrupulous sober living operators. He had been "curbed" - tossed onto the streets with nothing but a bag of clothes - when he failed in his treatment. 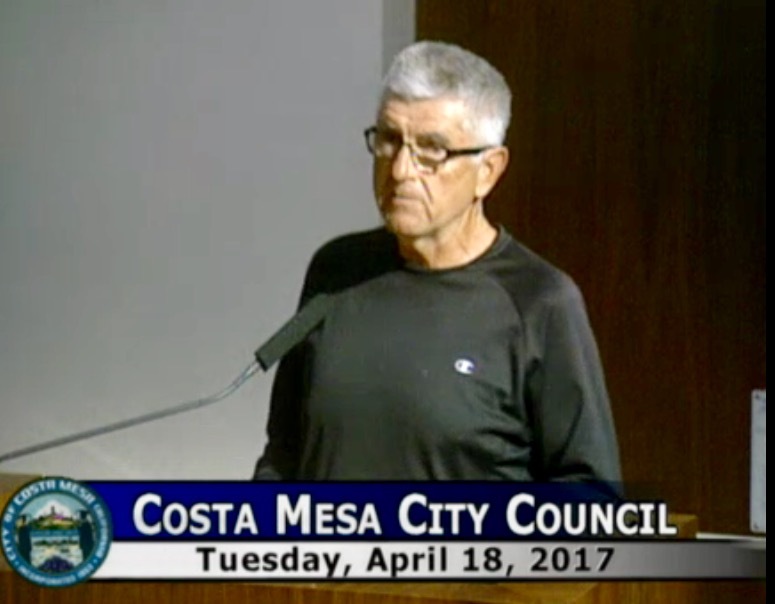 His shopping cart of belongings was parked next to the Council Chambers steps outside as he patiently waited three hours to speak. When the votes were taken the first one was a 3-2 vote, with Righeimer and Mansoor voting NO. The second was 5-0. And the clock approached 10:00 p.m.
Next Assistant City Manager Rick Francis guided the discussion of Public Hearing #3, the fee issue for new Medical Marijuana facilities to be located in a small section of the north part of town and which will NOT include any cultivation nor retail sales of marijuana products. Measure X, which was placed on the November ballot by the City as a counter-measure to two other Medical Marijuana sales items, was passed by the voters. This meeting was to refine and prescribe the fees any business operators planning to take advantage of this site would have to pay. The amount was determined to be just under $50,000 for starters, and ongoing permit renewals and business license renewals in the future. Read Luke Money's Daily Pilot piece on this issue HERE. 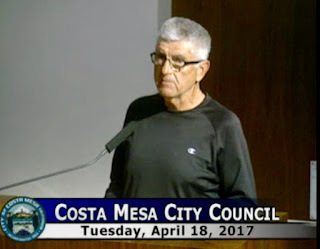 Former Planning Commission Chairman Jim Fitzpatrick, who was ousted from that job and a seat on the Costa Mesa Sanitary District because he violated the rules, is now a shill for businesses in the marijuana industry. Unlike the previous "Stakeholder's Meeting", where many unsavory characters attended and spoke, Fitzpatrick was one of only a few who spoke. 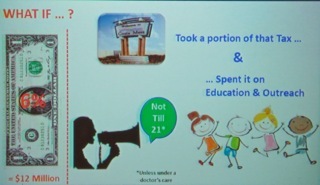 He presented a little slide show, below, which appeared to convince nobody in the auditorium of his mission. He's a sad sack of a guy. 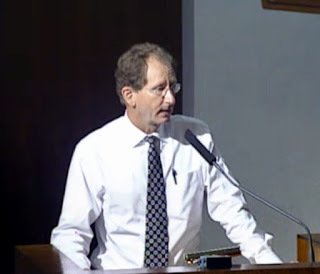 One of the speakers, Robert Taft who had been a sponsor of one of the other Medical Marijuana initiatives last year, complained that it's taking too long to get started. He echoed Fitzpatrick's mantra about the need for speed. Taft told us he had bought three buildings in the area in question and needed to begin making improvements while waiting for the Conditional Use Permit. It appeared that not many in the audience felt sympathy for him. Just after 10:00 the council passed the staff recommendation for the fee schedule on a 5-0 vote. 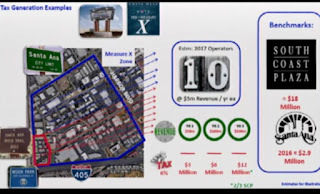 Next came New Business #1, the Urgency Ordinance dealing with the re-authorization of the collection of the fee to support Public, Educational, and Governmental (PEG) Channel facilities within the City. Public Affairs Manager Dane Bora made the brief presentation and, as anticipated, the council quickly voted, 5-0, to approve the passage. It took less than 3 minutes. Next was New Business #2, the discussion of Ambulance Transportation in The City. 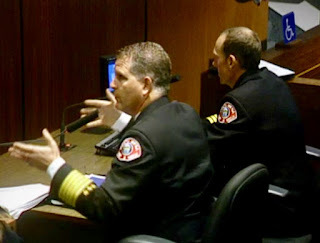 Fire Chief Dan Stefano and Division Chief Jason Pyle made the presentations. You may recall that this issue has been being flogged for several years - ever since then-Interim Fire Chief Tom Arnold first proposed a change. 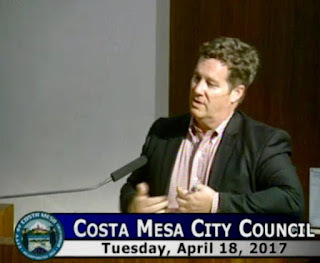 Since then it has been the subject of many hearings and the expenditure of lots of consultant dollars and staff time to come up with this final result - which seems to be a true hybrid design, the amalgamation of the best elements of several other proposals. 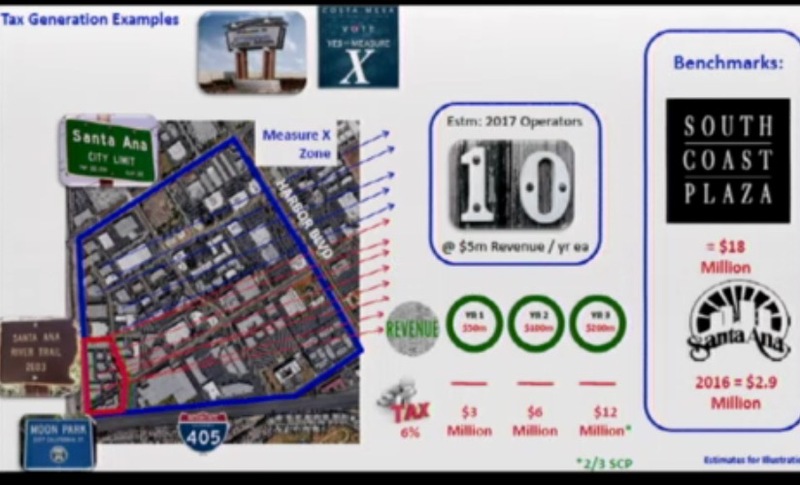 The short version is, we will finally have a deployment model that allows the full utilization of the six rescue ambulances we purchased for more than $1.6 million a couple years ago and, simultaneously, implement what is hoped to be a true public/private partnership in the delivery of medical aid in the City. After nearly an hour of conversation and presentations - Pyle went through a couple animated demonstrations to show how assets would be deployed using this model, which will rely on private contractors providing ambulance drivers for our equipment and also respond to any overflow situations that arise. Requests for Proposals for both the staffing segment and a separate billing element will be created and issued soon with the help of the same consultants that provided support in this process. The net result, if all goes as anticipated, will be nearly $2 million annually in cost recovery dollars. 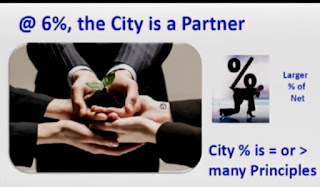 This is less than a couple previous iterations - half of one of them - but Stefano and City Manager Tom Hatch both apparently feel this is the best balance in service and cost recovery. One element only slightly mentioned is the fact that those contract drivers will not be employees, hence no PERS liability. It's very likely that element swung Righeimer and Mansoor's votes. The issue passed, 5-0, at 11:30 - and we still had a long way to go. New Business #3, presented by Assistant to the City Manager, Dan Baker, is councilman John Stephens' proposal to create a city-wide Independence Day fireworks extravaganza at the Orange County Fair and Event Center in an attempt to ween residents off the use of illegal fireworks - which had resulted in 1,200 calls for service last July 4th. 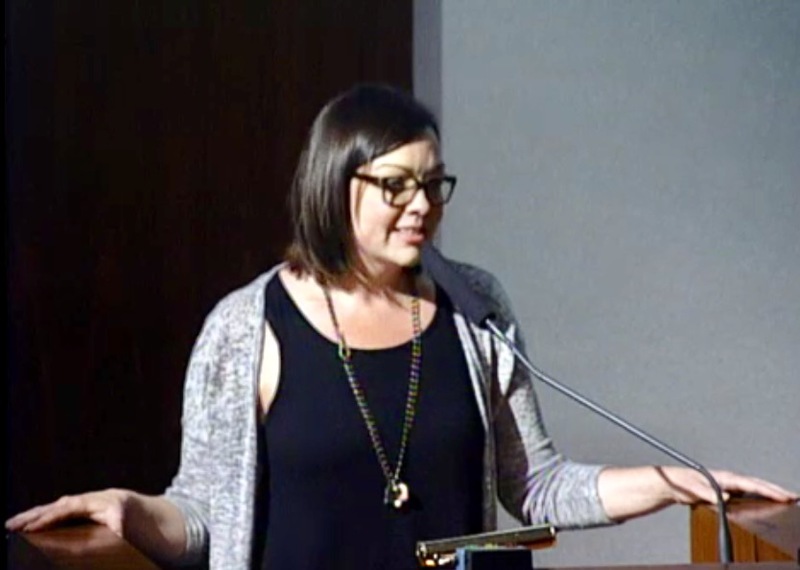 Stephens was asking for $50,000 in seed money from the City, which would be reimbursed by donations by individuals and organizations that would choose to underwrite this event. Stephens told us he already had commitments for more than $22,000 so far. He envisions this to be more than a fireworks display. He sees it as a community event, with local artists and performers on display. 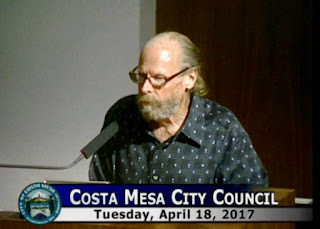 While it wouldn't directly conflict with the Pacific Symphony's performance that night - the City event would be scheduled to cease before the Symphony began - it was part of the discussion. 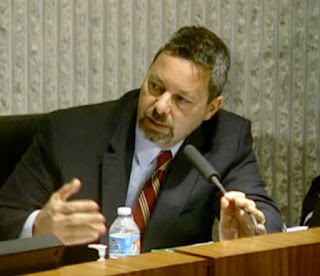 Stephens acknowledged that he didn't think it would actually eliminate all the illegal fireworks in the city, and the plan does NOT include reducing the sales of safe and sane fireworks due to pressure by youth sports groups that fund most of their annual activities with those proceeds. Nor did he wish to quash neighborhood block parties. 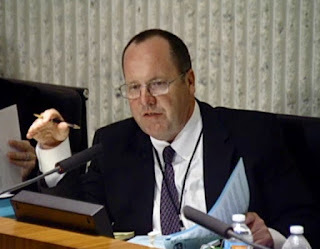 His proposal also called for increasing the penalties for those firing off illegal fireworks from the $150 to $1,000 and/or 6 months in the pokey. After much discussion, and at a moment which looked like Stephens was the only one on the dais who would be voting in favor of this proposal, the wind shifted. Clearly, each of the members wanted to do something. A half-dozen members of the public still in the auditorium stepped up to speak on this issue. 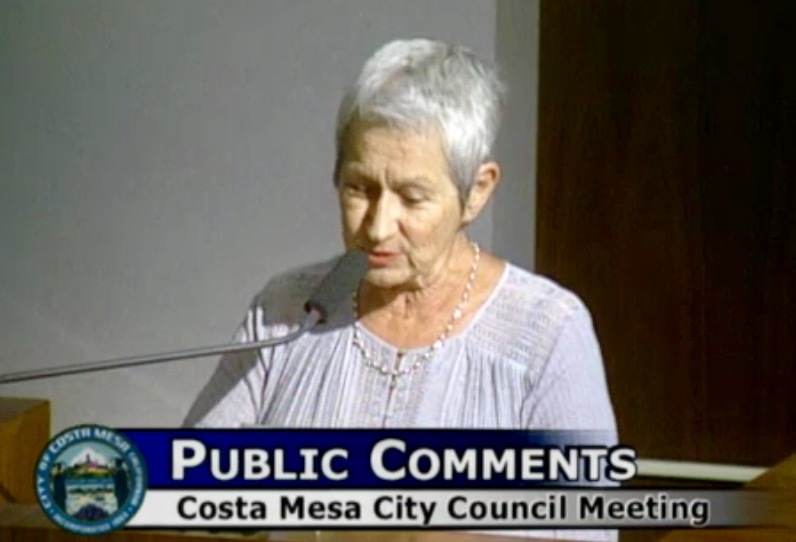 Flo Martin told of the illegal fireworks residue she found on her roof. Beth Refakes dredged up images of the infamous 60th Anniversary celebration, which turned out to be a nightmare. 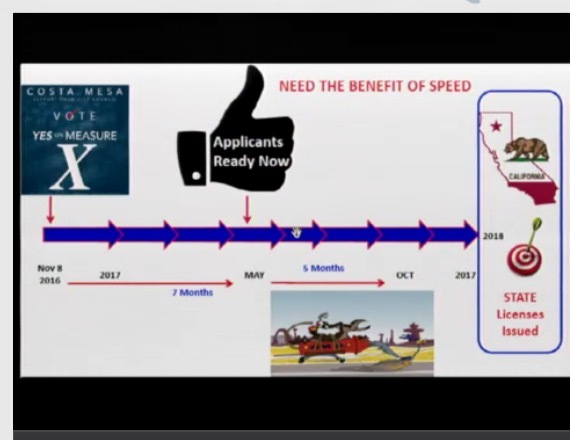 Ralph Taboada said he was all for it and observed that it might take a couple years to take off. He also observed that 22 other cities have some form of municipal celebration of that holiday. 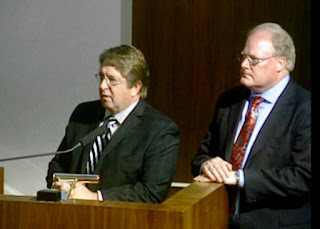 Richard Russell also was in support of it, as was Keturah Kennedy and an unidentified woman. 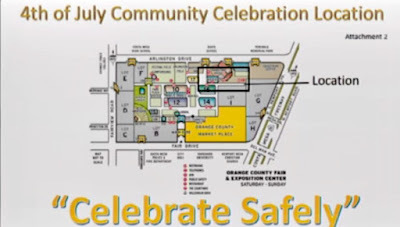 Move forward with the coordination of a centrally located City-sponsored Fourth of July celebration in partnership with the HERO's Hall Foundation at the OC Fair and Event Center. Allocate $50,000 in new revenue and expenditures for FY2016-2017 to cover event costs. Consider launching a proactive campaign to inform citizens that the City will be vigorously enforcing its prohibition against the discharge of illegal fireworks and seeking the maximum penalty for such violations. New Business #4, which was related to the Sober Living Home issue above, was next. 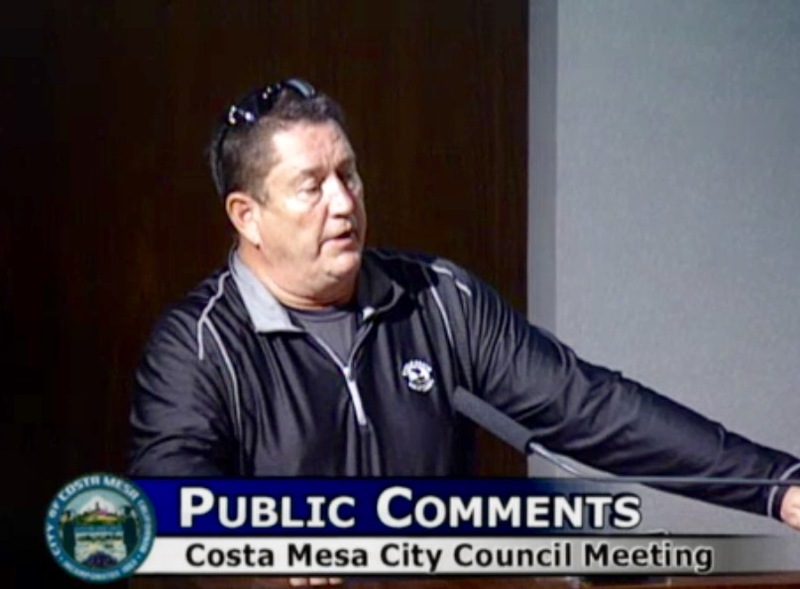 Due to all the discussion earlier on a related issue, it took all of 5 minutes for the public to speak and the council to vote, 5-0, to have all the appeals processed through the City Council, not the Planning Commission as was proposed. 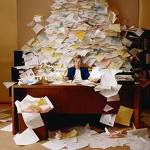 Boy, are they going to have a workload next month! The final issue on the agenda, New Business #5, was Mansoor's request to have a letter sent to the Senate in opposition to Senate Bill 54 - Law Enforcement Data Sharing. I kind of thought this might be a quick one, but is wasn't. Three members of the public had remained for this one. Keturah Kennedy, Executive Director of MIKA Community Development, spoke against sending the letter. 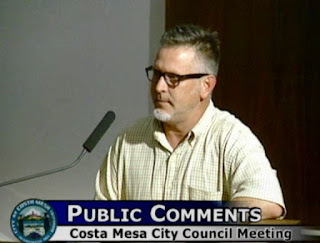 Bill McCarty also spoke against sending the letter. Richard Russell spoke in favor of it. 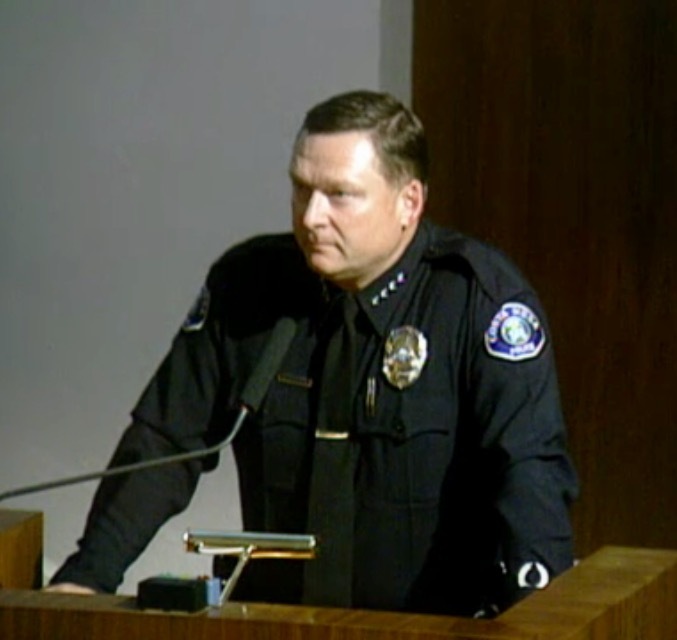 At one point Righeimer asked Police Chief Rob Sharpnack to step to the podium for a question. He asked him, "Do we ask people if they're here illegally?" 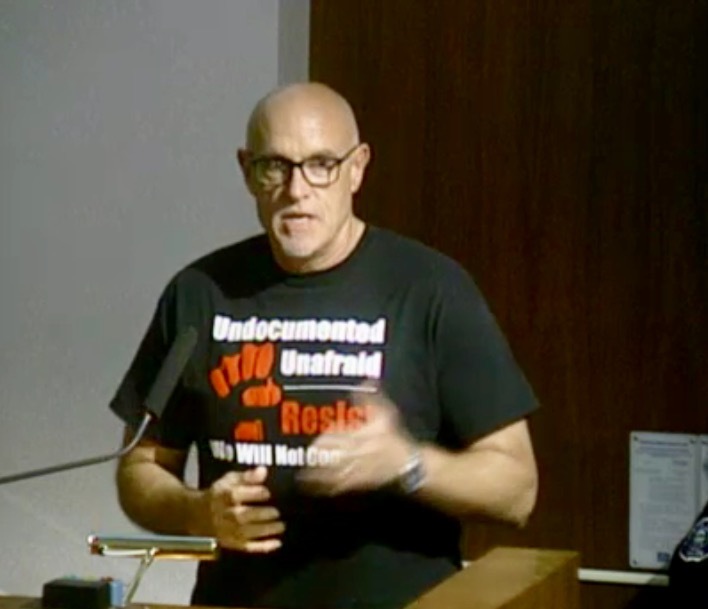 Sharpnack, of course, answered that his folks DO NOT ask people if they're here illegally, and seemed clearly ticked off at the question being asked. Mansoor was adamant that SB 54 is bad law, that would hamstring law enforcement across the state, but it became clear that he probably didn't have three votes necessary to direct the letter to be sent. At the end he seemed willing to amend his sample letter anyway council members wanted just to get it sent. That plea fell on deaf ears. Righeimer supported him, but the vote was 3-2, with Righeimer and Mansoor on the short end. OUTTA THERE JUST BEFORE 1:00 A.M.! The meeting ended at 12:55 and those exhausted few of us left in the chambers dragged ourselves to our cars and home... finally. In my view, there should NEVER be this many contentious items placed on one agenda. 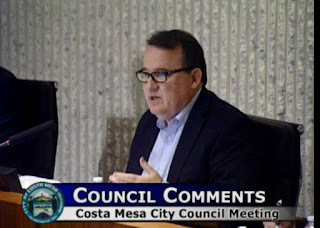 It has been my experience that few councils make good decisions after midnight. 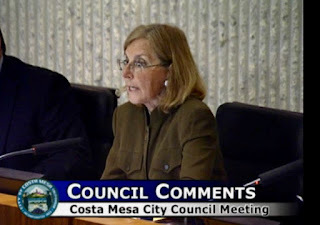 The Ambulance issue should have been presented at a Study Session, where it could have been thoroughly fleshed out in a more casual setting, then brought back to a future meeting where it would have taken just a few minutes for the council to approve. Instead, it took more than an hour last night. Very glad to hear there is a more efficient scenario for the ambulances. This has been anticipated for a very long time. Kudos to the council for bringing this forth. Righeimer looked quite conciliatory about this. What's up? 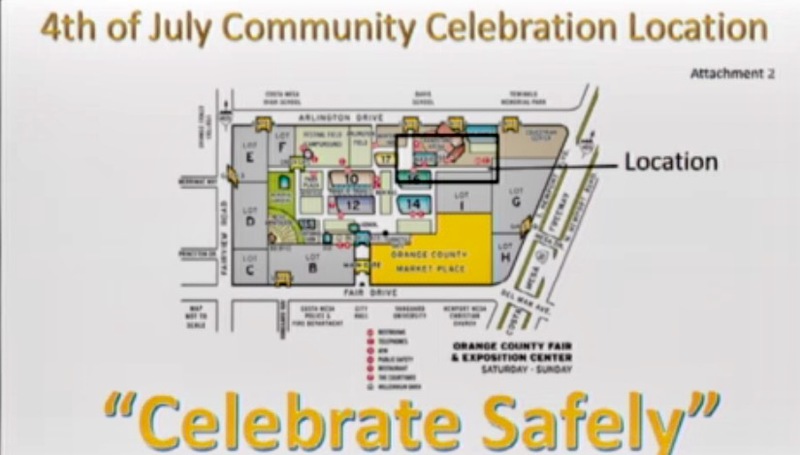 I am having flashbacks to the 60th with the initiation of the $50,000 for a community event. Let's hope there are better checks and balances in place than when Righeimer got his hands on things. I like the idea of a centralized fireworks celebration; however, if anyone thinks this will stop the illegal fireworks in any way, they would be wrong. Seems it would make more sense to do something about that before bringing even more into a city with a minimalized police department. People are angry and afraid. Not a good scenario for any council. Let's see what they do. Thank you Geoff. Who will enforce the rules about "curbing" on sober living home operators? We haven't enforced rules up to this point so I have my doubts well start now. 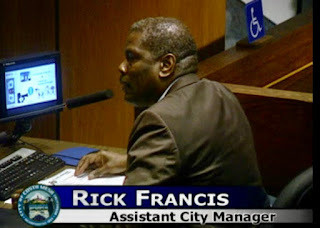 Would it really be so difficult to schedule a third council meeting each month while the four year backlog is worked through? Seems like that would be better for all involved rather than sitting through hours long meetings. 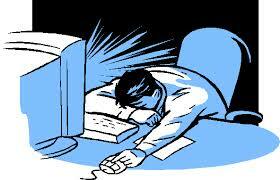 Plus, use study sessions rather than long staff presentations at council meetings. 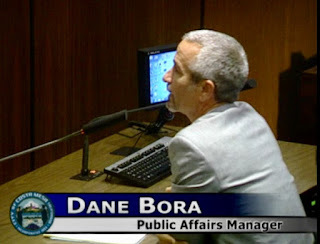 No wonder so many don't bother attending council meetings, they're mind numbing! Just a point of interest, but I believe Mansoor collects a pension from his position with the OC Sheriffs Department. Is he going to relinquish that? 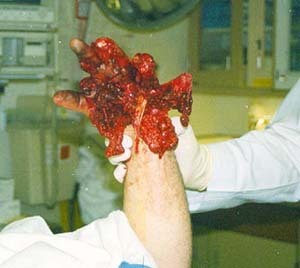 Or is this a "I got mine, lets do away with yours" situation? Allan has been collecting a pension of slightly over 44,000 since 2014 for 15.38 years of service.